Take a step back in time in New York. When I was a teenager, I loved reading an American comic book called All-Star Squadron. Set during World War II, it featured a dazzling array of superheroes fighting spies and evil masterminds trying to disrupt the war effort. The team's HQ was the Trylon and Perisphere, two buildings left over from the 1939 New York World's Fair held in Flushing Meadows. In our reality, these striking structures – one a tapering tower, the other a huge sphere – were demolished soon after the fair had closed. If only they had survived. At the fair, visitors crossed from the Trylon to the Perisphere on the world's longest escalator, then walked around its 60-metre wide interior to view a city of the future. That sounds like fun. But I'll take what I can get, which in this case is the Unisphere, a relic of a later World's Fair in 1964. Referencing the Perisphere, it's a huge globe of the world, with the continents floating on a sphere of curved steel beams representing longitude and latitude. On a sunny day like today the blue sky fills in the spaces in between, resembling oceans. 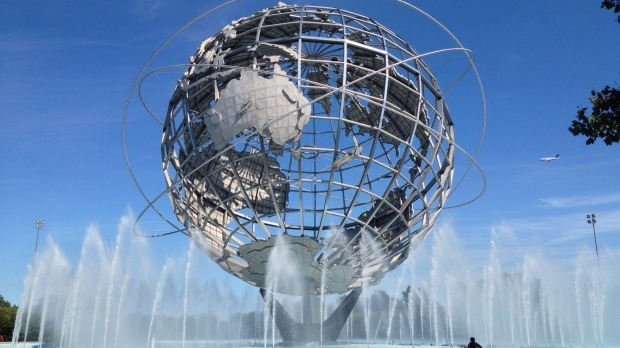 Like its 1939 predecessor, the Unisphere is a symbol of optimism about the future. It's also huge, rising 43 metres and surrounded by fountain jets. Nearby is the former New York Pavilion, the only remaining building from the 1939 fair. From 1946 to 1950 it also served as the home of the United Nations General Assembly. In late 2013 the Queens Museum took over the entire building after a major renovation. Not that it's your standard art gallery. Its collection is as diverse as the New York borough whose name it bears, including contemporary work by international artists. It's also inherited a number of treasures from the World's Fair days. The first – and perhaps oddest – of these is a vast relief map of the New York City water supply system of the 1930s. Painstakingly representing the contours and water channels of the surrounding countryside, at 50 square metres it proved too big to be exhibited. Inherited by the museum, it's been carefully cleaned and is a testament to bureaucratic zeal. More absorbing is the collection of memorabilia from the two World's Fairs, a fascinating assembly including plates, statues, posters, model trains and fanciful space vehicles. The triangular and circular shapes of the Trylon and Perisphere appear in various forms, including salt and pepper shakers. The museum's big finale is the Panorama, another leftover from the 1964 fair. Covering nearly 900 square metres of floor space, this vast architectural model of New York City includes nearly 900,000 buildings. In 1964 visitors took a simulated helicopter rode over the model; nowadays they walk above it via glass-floored walkways. Moving slowly down from the top, I have fun spotting places I've visited across the great city as the lighting phases from day to night, and tiny planes glide in to land at model airports. The Panorama has been updated over the years to reflect new buildings on the New York skyline. Restless, ever-changing, it's a perfect reflection of the city. The Queens Museum is in Flushing Meadows–Corona Park, New York City, reached via Mets-Willets Point subway station. Entry $8, open noon-6pm Wednesday to Sunday, see queensmuseum.org. The writer was assisted by nycgo.com.